Flock‘s CEO Bart Decrem expanded the beta over the weekend to 1,007 people, most of whom are now blogging about it. 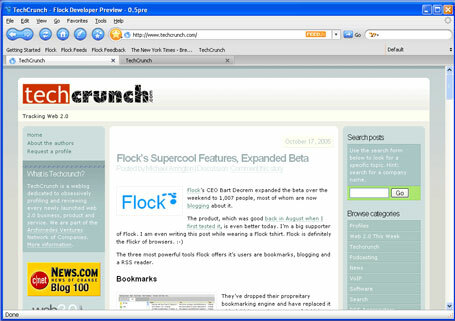 The three most powerful tools Flock offers it’s users are bookmarks, blogging and a RSS reader. They’ve dropped their propreitary bookmarking engine and have replaced it with del.icio.us. I have a ton of del.icio.us bookmarks – thousands – and it took a while for the browser to chug through them all during the import procedure. But it did, and I now have one hell of an interface into my favorite bookmarking service. Since Flock supports tabbed browsing, I can keep bookmarks open in a separate tab and refer back whenever. Partnering with Del.icio.us is brilliant. I do not know if they have plans to integrate with other social bookmarking sites, but I imagine it would be fairly simple for them to do. The blogging tool was, and remains, absolutely the best I’ve seen. This tool brings flickr pictures directly into the blog tool, allowing simple drag and drop into the post. It’s dual-pane, with both wysiwyg and html interfaces (I actually preferred the old toggle method of changing from html to wysiwyg, but I’m not complaining). Setup is very simple. It just works. Flock also has a built in RSS reader that is both dead simple to use and yet powerful enough for heavy users. A simple drop down box can be accessed for any page that allows you to grab the feed for the page you are currently on, and add it to an existing or newly created folder. Feeds can be tagged, and the viewer allows for expanded or collapsed feed viewing. There are some speed issues with this version, 0.5, but in my opinion it has more than enough features to convince web users by the millions to switch from their default browser and go with Flock. Let’s launch this thing!